Tencent Holding employees wait in line to receive red packets from senior management at the company's headquarters in Shenzhen. Those people are not lining up to buy new iPhones, Lady M's signature mille-crepes cake, or HeyTea's cheese-topped drink. They are employees of Tencent Holdings waiting outside the internet giant's headquarters in Shenzhen to receive red packets from company chairman Pony Ma Huateng and other senior management. A long line started forming from Tuesday morning for a chance to get a second of face time with Ma, who in Lunar New Year tradition personally hands out red envelopes containing money to employees as a form of good wishes. The most diehard of the ﻿hongbao getters was in place since before 8pm on Monday, meaning the first in line had waited overnight for more than 12 hours to be the first person to get the "blessing" from Ma, who was dressed in a bright red jumper. Photos showed the line was so long that it snaked around the new headquarters of Tencent in Shenzhen's Nanshan district, all the way up to the 48th floor of the building, where senior management were greeting employees. Staff queued in the shape of a giant "fu" character, which means prosperity. "I waited for three hours and got 200 yuan in total from the four executives," said a Tencent employee. "Not everyone gets the same amount. It depends how lucky you are." Besides Ma, Tencent president Martin Lau Chi-ping, chief information officer Daniel Xu and chief strategy officer James Mitchell were also present to hand out ﻿hongbaos. It is customary in many parts of China for companies or bosses to give their employees red packets to start the new work year. "I got 100 yuan from Pony and 50 yuan respectively from other three," said another Tencent employee. "As far as I know, Pony always gives 100 yuan and other management give 100 yuan or 50 yuan." Tencent did not disclose how many employees lined up nor the total amount of money dispensed. 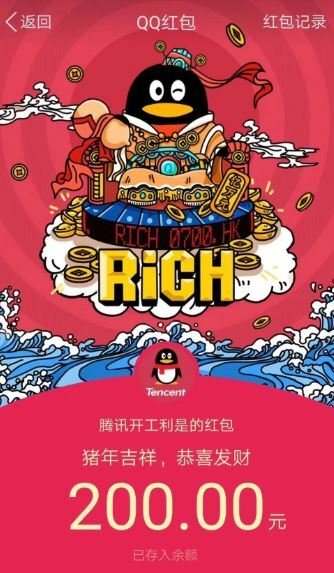 Before Lunar New Year in 2014, Tencent co-founder Tony Zhang assigned a WeChat team member to improve the way Tencent traditionally handed out red packets to staff. As a result, the WeChat Red Packet was developed as a way to send money digitally to friends. WeChat's Red Packet became an overnight sensation during the 2014 holiday period with more than 8 million Chinese receiving over 40 million hongbaos during the period, leading Alibaba Group Holding executive chairman Jack Ma to dub it the "attack on Pearl Harbour". Users started to link their bank accounts to their WeChat mobile wallet and it started to compete with Alipay, the mobile payments platform of Alibaba affiliate Ant Financial Services. New York-listed Alibaba owns the South China Morning Post. This year, 823 million people used WeChat's hongbao service on Lunar New Year's Eve, an increase of 7.1 per cent from the year before. Given Tencent has more than 50,000 employees spread over China and overseas, only those based in Shenzhen can line up for the red packets. For those staff in Beijing and elsewhere, they can take consolation in the digital ﻿hongbaos from the company. According to one Tencent employee, 400 yuan was sent to his WeChat account from the company this morning. No need to wait in line for that one.